These are Miniature Pinschers currently available for adoption. 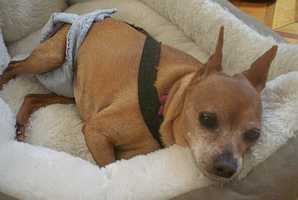 If you have, or know of a Miniature Pinscher in need of rescue, please e-mail Nancy at vinnysnag@gmail.com. 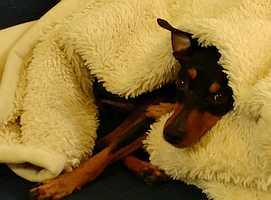 If you would like to apply to become an adoptive home, please fill out and send the IMPS Min Pin Adoption Application. Qualified adoptive homes are selected based on proximity to the dog to be adopted and length of time on the wait list. MA We currently have no dogs available for adoption in MA, but do have dogs available in neigbouring states. Click HERE to see the list of states. MD We currently have no dogs available for adoption in MD, but do have dogs available in neigbouring states. Click HERE to see the list of states. Vic - "ADOPTION PENDING": 7 yr old black & tan male, neutered, docked tail and uncropped ears. 19 lb. Fully vetted. Owner give-up. Vic loves his people. He gets along well with other small dogs. He is good with cats. He loves adults, and loves to cuddle with adults and under blankets. Note: Vic is located in Saco, ME - and we will not fly this boy. ADD DATE: 09/28/18 "ADOPTION PENDING". MI We currently have no dogs available for adoption in MI, but do have dogs available in neigbouring states. Click HERE to see the list of states. MN Christian: (DOB 10/11/2011) black & tan male, docked tail and uncropped ears. Shots up-to-date. Minpin with attitude..... that's all you need to know. He is a great little guy that will charm you if he likes you and drive you crazy if he doesn't. Note: Christian is located in Stillwater, MN - and we will not fly this boy. MN Crazy Suzie: 2 yr old black & tan female, spayed, undocked tail and uncropped ears. 12", 10 lb. Fully vetted. Rescued from shelter. Crazy Suzie is a beautiful all natural girl that has the basics down about keeping her home clean but she's still learning about being a part of a family. She's learning but it's slow. She has not bitten, even using the dremmel on her nails, but she knows to go in her crate when it's open and to go outside when the door is open and you open her crate. With that much going for her I'm hoping someone will find it in their heart to help her know love. She has already made huge improvements! Please fill out an application if you think you have the love to offer Suzie! Note: Crazy Suzie is located in Stillwater, MN - and we will not fly this girl. 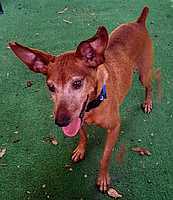 Karman aka Phoenix: 7 yr old stag red female, spayed, docked tail and uncropped ears. 12", 10 lb. Note: we will not fly this girl. MO We currently have no dogs available for adoption in MO, but do have dogs available in neigbouring states. Click HERE to see the list of states. MS We currently have no dogs available for adoption in MS, but do have dogs available in neigbouring states. Click HERE to see the list of states. MT We currently have no dogs available for adoption in MT, but do have dogs available in neigbouring states. Click HERE to see the list of states. 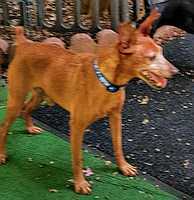 Sean Murphy: 6-8 yr old red male, neutered, docked tail and uncropped ears. 10", 12 lb. Fully vetted. Rescued from shelter. Sean Murphy has the luck and looks of the Irish! He came in as a breeder release with no name and unused to kindness, but he is finding he loves it! He is hesitant, but a few kind words and a stroke on his chest or side, and you can just see his face open up to you. He's coming into his own - gaining much needed weight and nutrition, confidence and youthful energy. He now does the Minpin spring to go out and for food or treats, and will readily come when called, jump up on the lawn swing with me and just bask in attention! He house-trained quickly on a schedule and keeps his crate & bed clean. He'll need an introduction to a leash, which we are starting. This is one sweet little man, a little shy, blooming with kind treatment, and gets along with other dogs. An adopter experienced in trust-building with a former Minpin breeder dog will be delighted with how easily he responds. Note: Sean Murphy is located in Charlotte NC. 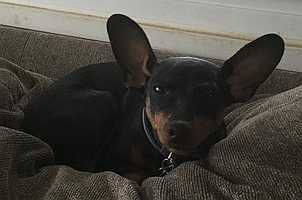 NC Prissy is a 13 yr old cute, sweet black & tan girl that is housebroken. Prissy is spayed, up to date on shots, micro-chipped and has natural ears and long tail. She loves to be outside to sun, loves car rides and crate trained. Currently Prissy is about 4 lbs overweight but she is losing her weight slowly. She wants to be the center of attention so she would do best as an only dog. "I am an elite member of the IMPS oldie but goodie club. Click HERE for special details about adopting me...."
ND We currently have no dogs available for adoption in ND, but do have dogs available in neigbouring states. Click HERE to see the list of states. NE We currently have no dogs available for adoption in NE, but do have dogs available in neigbouring states. Click HERE to see the list of states. NH We currently have no dogs available for adoption in NH, but do have dogs available in neigbouring states. Click HERE to see the list of states. Ginny: 7 mth old black & rust female, soon to be spayed, docked tail and uncropped ears. 10", 10 lb. Fully vetted. Owner give-up. Ginny came into rescue at no fault of her own. She is a sweetheart and a pleasure to foster. She does have puppy energy so looking for someone who will continue to exercise with her. She loves to play with toys and also loves to snuggle. She is very quiet In her crate at night. Does have a very high pitched bark so maybe not good for a apartment. Kids 10 and older she does get a little nippy when my son picks her up and I am working on this. Note: Ginny is located in Wayne, NJ - and we will not fly this girl. NM We currently have no dogs available for adoption in NM, but do have dogs available in neigbouring states. Click HERE to see the list of states. NV We currently have no dogs available for adoption in NV, but do have dogs available in neigbouring states. Click HERE to see the list of states. Cookie: 5 yr old black & tan male, neutered, undocked tail and uncropped ears. 12", 14 lb. Fully vetted. Rescued from shelter. "Hi my name is Cookie, I would do best in a household without cats or children. I am mainly housetrained, but do mark inside the house at times. I like car rides and long walks in the country. I am a very timid dog that becomes nervous with changes in my environment. Due to my fears, I need the companionship of another dog my size to help me with these issues." Note: Cookie is located in Bainbridge, NY. 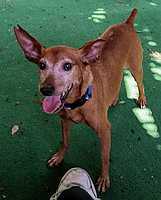 Brooke: 8 to 10 yr old red female, spayed, docked tail and cropped ears. 10.5", 10 lb. Fully vetted. Rescued from shelter. "Hi, my name is Brooke, but, my foster parents call me Pretty Girl. 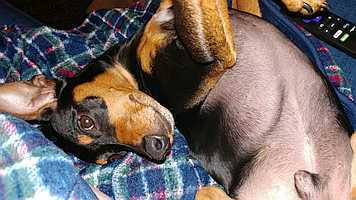 I am a diabetic Min Pin who requires two shots of insulin a day, and a restrictive diet. Unfortunately, due to my diabetes, I am mostly blind and have issues holding my bladder. I also have liver disease and severe arthritis in my hips, which also requires daily medications to help my liver and arthritis. I would do best in a home without cats or dogs. Due to my health issues, I am not very active these days." Note: Brooke is located in Bainbridge, NY - and we will not fly this girl. If you have any queries about your application, please contact your Regional Coordinator. This page was last updated on Apr 08, 2019 by Mag at imps@mgbeng.com.